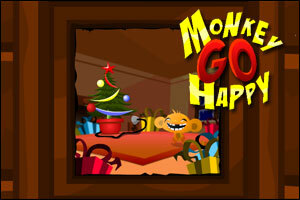 Monkey GO Happy is the latest Point’n’Click puzzle skill game developed by Robin Vencel, the author of the Popular Bowja the Ninja series. Your goal here is to click objects and do other stuffs with your mouse to make the Monkey GO Happy! This game is neither long nor difficult, but it is entertaining and nicely done. I liked it and my kids did too! That was sooo cute. I got the Cheery Chimp! Happy Holidays, Ya’ll. why does my knife disappear whenever I touch it?? look at the roman number on the wall ! this game is really vute but too easy ! Posted on Wednesday, December 24th, 2008. Follow any responses through the RSS 2.0 feed.